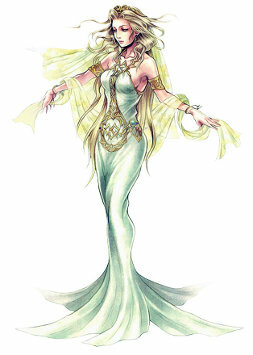 Cosmos (コスモス [cosmos] in Japanese) is the Goddess of Harmony in Dissidia. She was created as a means to control Garland/Chaos by the Lufenians of the past, and since the breaking down of the world she has been the opposing force to chaos's powers, summoning forth warriors to her cause from different times and dimensions to take on Chaos and his warriors. 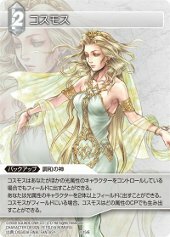 She bears great resemblance to other powers of light/dawn/harmony, goddesses by the names of Altana and Minerva, and indeed simply Goddess. Cosmos is voiced by Sumi Shimamoto in the Japanese version, and Kathleen McInerney in the English version. Both apply to Dissidia and Duodecim both. Cosmos (it is unknown if this is what she was referred as originally) was a clone created in the image of Cid's wife, made by the Lufaine for the sole purpose of controlling the rebelling will of Garland, an unstoppable weapon of unknown origin. The manikin they created was infused with the memories of Garland of the real person he considered his mother, and likely combined with an unknown power found beyond the space-time continuum of Gaia, one bearing the powers of harmony. Once Garland's powers were unleashed fully, in rage, this being became the Cosmos we know today. In the newly created barren dimension greatly resembling the Gaia that it once were, but fragmented into pieces and holes in its continuum, Cosmos and the newly-born Chaos were pitted against each other by Cid in an effort to get out of the dimension. Cosmos dutifully fulfilled her position in the war, and called forth warriors to her name, sending them out to defeat Chaos. Some time after the first cycle of wars began, a warrior of hers called Prishe brought forth an empty vessel, that of the Warrior of Light. At first she was unwilling to make him hers, but after recognizing something in him she gave him a part of her power. After that the Warrior was her most faithful warrior, at her side until the end. It seems that she might have developed some fond feelings for him. The cycles of war continued through 11 battles, and Cosmos lost each time. The 12th battle started much like any other. After her awakening Shinryu brought forth her warriors from the last battle, and Cosmos brought in at least one new warrior, Tifa. She sent her warriors out to battle the forces of discord. That is the point when it becomes unknown if things have changed. Towards the middle of the cycle she called back her warriors and infused them with fragments of her own power, telling them to search for Crystals, that the Crystals would bring them victory. Once again her warriors scattered all over the fragmented dimension of once-Gaia. However, that is where things truly started changing. The side of Chaos opened a door to the Rift where manikins, lifeless killing machines, were sealed. These manikins immediately started targeting her warriors, and some of them started to think they might lose - unaware that their side had already lost 11 times. Cosmos remained on her throne in the Sanctuary of Order, guarded most likely by the Warrior of Light, and continued doing nothing but observe, for taking direct hand at the events of the world would break the rules and result in her (likely immediate) loss. She followed as her warriors not only fought against each other, but abandoned the search for Crystals in favor of closing the door to the Rift where the manikins were entering Gaia. Only the Warrior stayed by her side. In the end, while the majority of her remaining warriors managed to seal the door to the Rift, they did not succeed in doing so before a great manikin army made a direct assault on the Sanctuary. The Warrior at her side fought valiantly, but eventually fell and was about to be defeated. Cosmos abandoned the rules of the conflict in her desperation and saved the Warrior, bringing about the end of the 12th conflict as her loss. Cosmos's appearance is very simple. She has bright blue eyes and long locks of flowing golden blonde hair. Some kind of a power seems to keep her locks flowing at all times. On her head she has a delicate golden crown, and the same type of decoration can be found on the front of her dress, going down between her breasts and circling her waist. Said dress is long and white and made of some (likely shimmery) light fabric. On her shoulders Cosmos wears an opalescent white stole, and on her upper arms she has bands of golden armlets. She also has a golden bracelet on each hand. What kind of shoes she wears, if any, is unknown due to the dress being plenty long enough to cover her feet at all times. 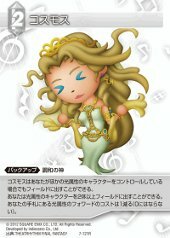 Cosmos has had several appearances in FF-TCG, bearing the element of Light.